The Lincoln mechanical grease overflow prevention system is designed to improve worker safety by helping to prevent spills that can cause slip-and-falls, fire hazards or other concerns. Compatible with any FlowMaster grease reservoir, this product is easy to install, simple to operate and reduces the manpower needed for reservoir filling, freeing personnel for other tasks. It features heavy-duty, all-steel construction with anti-corrosion plating to withstand harsh environments. Because it operates mechanically, the system requires no electricity to function. The high-pressure mechanical grease overflow prevention system shut-off valves are available in ½-inch NPT. 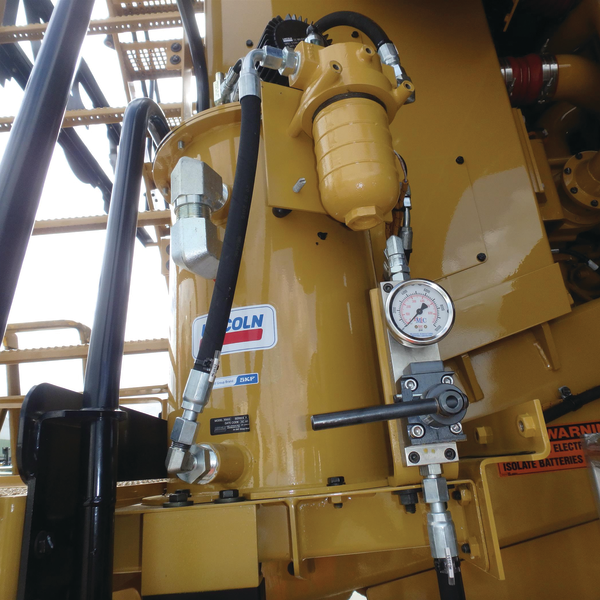 The system can be operated with or without a Lincoln grease level sensor, which enables it to be connected to a grease level gauge at the fill station or in the cab. The Centro-Matic fill filter also can be mounted after the shut-off system when the grease supply pressure is regulated below 310 bar (4,500 psi). The mechanical grease overflow prevention system is suitable for mining, aggregate and industrial applications, as well as for use on off-road construction equipment. Optional components are available for customized installation. For more information about the Lincoln mechanical grease overflow prevention system, contact Customer Service at 1-314-679-4200, Ext. 4410, or visit our web site at lincolnindustrial.com. Products are listed by the most recently introduced.